Canillas de Aceituno, Salares, Sedella, Canillas de Albaida, Archez, Competa, all villages which stand at the foot of the impressive Tejeda and Almijara Sierras; all morisco (Moorish convert to Christianity) villages, where vines were the main crop and are still an important element in the landscape as well as the economy; all display similar characteristics, reflecting the true essence of the Axarquia region, its scenery, its way of life and its history. The layout of their streets and the architecture of their whitewashed houses, which create unforgettably-picturesque corners, gives them a unique seal of identity, so much so that, together, they make up what is known as the Mudejar Route (Ruta del Mudéjar). The upper part of the village offers an impressive panoramic view of the region stretching all the way to the coast. The highlight of its fascinating surroundings is the gorge of the River Almachares, while worthy of note in the village itself is the church of Our Lady and St. Leon the Great. The village was settled by the Romans, who exploited the gold mines at La Rabita, as did the Arabs later on. The present-day site of the village is of Arabic origin and was known first as Caniles, to which Aceituno -from the Arabic “azzeitun”, meaning oil- was subsequently added, the village being known by its modern name by the end of the 16th century. It was conquered by the Catholic Monarchs and subsequently incorporated into the estate of the Count of Cabra, along with Archez and Corumbela. It played a key role in the revolt by staged by the moriscos (Moorish converts to Christianity) in the mid 16th century. Chronicles of the time tell us that Al Muezzin, a rebel from the Alpujarras region, induced locals to rebel against the establishment in an attempt to free his wife, slave to an Old Christian; the first skirmishes saw the deaths of nine Christians, which brought such cruel, indiscriminate repression of the converts that a full-scale revolt developed. In 1569, the governor of Valez-Malaga, Arevalo de Zuarzo, crushed the rebellion in a location known as Peñon de Frigiliana and applied exemplary punishment: the Moors’ houses and castle were burned to the ground and the people themselves deported; thus the village was left practically abandoned and was subsequently repopulated by inhabitants of Lucena, Porcuna, Martos and Andujar. 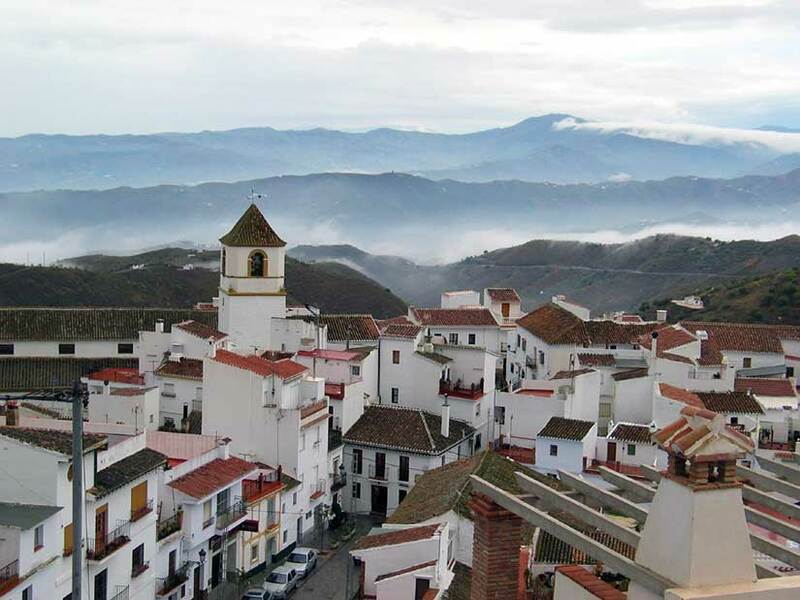 The village was one of the areas of the Axarquia region worst affected by the Andalusian Earthquake of Christmas Day 1884, whose epicentre was in the nearby Sierra Tejeda. Six people were killed, many more injured and numerous houses were completely destroyed. King Alfonso XII, accompanied by the War and Interior Ministers, visited the area in the first few days of 1885, and, on learning of the magnitude of the catastrophe, promised immediate Crown and government aid.